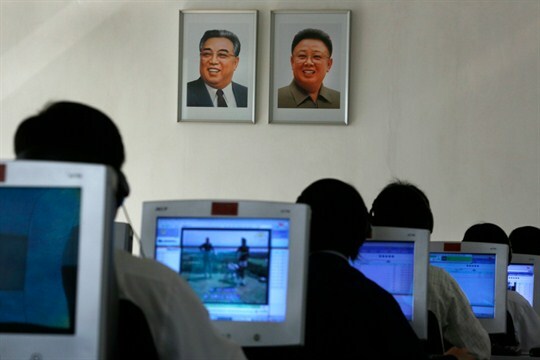 North Korean students use computers in a classroom with portraits of the country’s later leaders Kim Il Sung, left, and his son Kim Jong Il hanging on the wall, Pyongyang, North Korea, Sept. 20, 2012 (AP photo by Vincent Yu). 2018 has been the year of diplomacy for North Korea’s totalitarian government, with Supreme Leader Kim Jong Un meeting with the leaders of South Korea, China and the United States, in addition to reportedly planning a visit to Russia. But behind this charm offensive, the regime in Pyongyang is continuing to develop its cyber warfare capabilities and conduct espionage campaigns against a wide range of targets. In an interview with WPR, Adam Meyers, vice president of intelligence at the cybersecurity firm CrowdStrike, explains the motives and methods behind North Korea’s malign cyber activities and how the private sector is adapting to this threat.